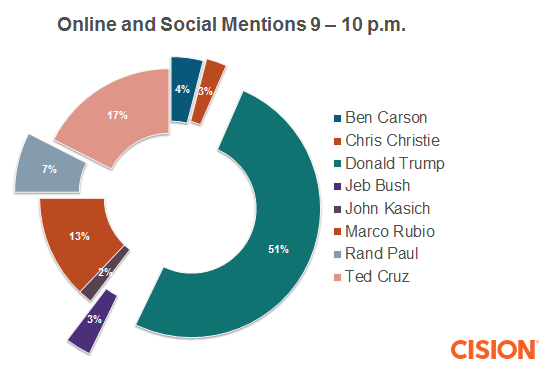 Cision is monitoring the primary season, and we analyzed 675,000 tweets between 8:00 a.m. and 11:00 p.m. 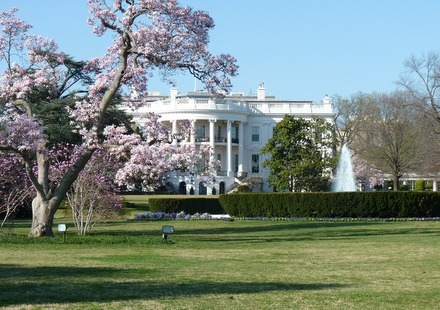 ET on January 28 and looked at how American voters responded to the candidates. There is a golden rule in PR that a brand should make a PR hit happen almost at every possible turn. You never want to be the brand representative that drops the ball and lets a broadcast or radio opportunity fall through the cracks giving it directly to your competitors. It seems billionaire reality TV star Donald Trump forgot about that rule at the Republican presidential debate on January 28. Sometimes politicians lose because they slip down staircases; other times because they say scream too loudly at political rallies like Howard Dean did in Iowa during the 2004 election. For so long, Trump had been the Teflon Don of political life in America. Nothing could stick. Until last night that is, when he chose to skip a Fox News Debate held in Iowa, just 96 hours before Iowa Republicans caucused for their choice of presidential candidate. Trump instead held a rally for veterans a few blocks away from where the debate took place, raising $6 million in the effort. Earlier in the day this looked like a brilliant plan. 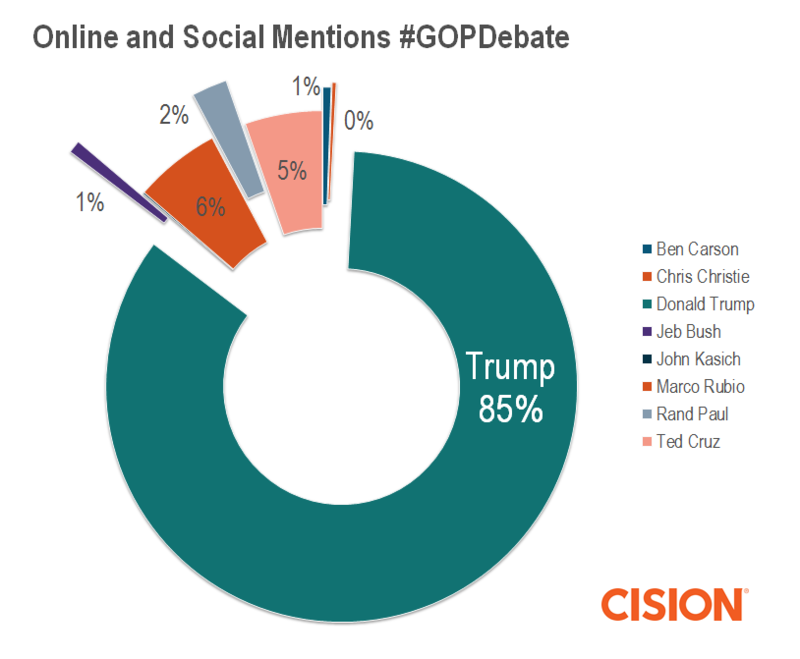 Trump controlled 85 percent of the social share of voice (percentage of mentions of the candidate on Twitter). A new NBC News and Wall Street Journal poll released Thursday morning put Trump ahead of Cruz, by seven points, 32 percent versus 25 percent. In previous debates, Trump’s share of voice ranged between 30 percent and 50 percent, but never this high. Before the debate started, senators Ted Cruz and Marco Rubio had a combined share of voice of 11 percent. Trump was #winning. When brands control conversations at this scale, it is either total market dominance or full crisis mode. Trump’s campaign is a mix of both. And like a golden-haired Icarus, when the debate ran past 10:00 p.m. ET – now one full hour Trumpless – the billionaire’s wings melted as he flew too close to the sun and he fell back to earth. Midway into the debate, Trump had lost 34 percentage points from his original share of voice. He still led, but his rivals had picked up steam. You see, when the highest rated news broadcast in the country takes two hours of its programming and dedicates it to a topic, it is beneficial to engage when given the opportunity. By 11:00 p.m. at the end of the debate, Trump’s good-fortune earlier had turned sour. His share of voice sat in the 30 percent range, where it has been since November. That is except in Iowa. 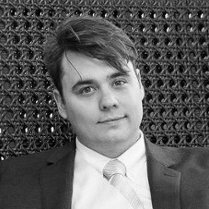 Trump is a media icon, as John Dickerson of Face the Nation and Slate.com has written, he creates his own political gravity. Iowa defies the laws of political physics, as has Trump for much of the primary season. But Thursday night proves he can be hurt, even though the wound is self-inflicted. He can bleed share of voice like any politician or company. Between 9 p.m. and 10 p.m. ET, he led the Hawkeye State with 31 percent share of voice, over Cruz with 30 percent. By 11 p.m. ET, that lead evaporated into the gathering storm of long-lost opponents like Rand Paul, who returned to the debate stage that evening, and Marco Rubio, who pollster Frank Luntz’s focus group said won the debate. Rubio increased his share of voice in Iowa by five points tying himself at 18 percent share of voice with Trump. 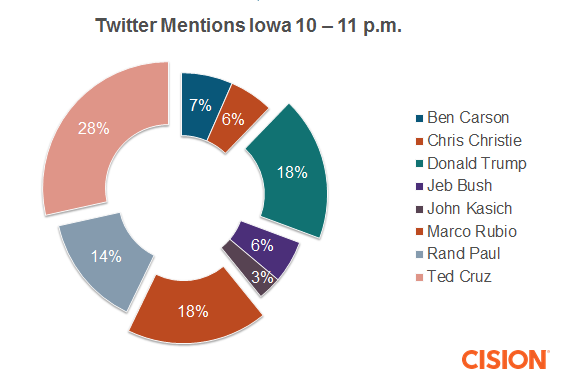 Cruz ended the evening with 28 percent of the conversation in Iowa tagging his name. By skipping the debate Trump gave his competitors additional airtime that he’d typically be able to drain away. This is what happens when brands skip interviews, end important programs or fail to capitalize on PR and social media. Being absent from the conversation forfeits your chance to win. If Trump loses Iowa, it is because he forfeited the opportunity to engage in the media.